The fastest growing media outlet for advertising is the Internet. Compared to spending in other media, the rate of spending for Internet advertising is experiencing tremendous growth and in the U.S. trails only newspaper and television advertising in terms of total spending. Internet advertising’s influence continues to expand and each year more major marketers shift a larger portion of their promotional budget to this medium. Two key reasons for this shift rest with the Internet’s ability to: 1) narrowly target an advertising message and, 2) track user response to the advertiser’s message. The Internet offers many advertising options with messages delivered through websites, social media or by email. Creative Types – Internet advertising allows for a large variety of creative types including text-only, image-only, multimedia (e.g., video) and advanced interactive (e.g., advertisement in the form of online games). 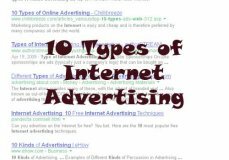 Size – In addition to a large number of creative types, Internet advertisements can be delivered in a number of different sizes (measured in screen pixels) ranging from full screen to small square ads that are only a few pixels in size. The most popular Internet ad sizes include banner ads (468 x 60 pixels), leaderboard (728 x 90 pixels) and skyscraper (160 x 600 pixels). Placement – The delivery of an Internet advertisement can occur in many ways including fixed placement in a certain website location (e.g., top of page), processed placement where the ad is delivered based on user characteristics (e.g., entry of words in a search box, recognition of user via Internet tracking cookies), or on a separate webpage where the user may not see the ad until they leave a site or close their browser (e.g., pop-under). Delivery – When it comes to placing advertisements on websites marketers can, in some cases, negotiate with websites directly to place an ad on the site or marketers can place ads via a third-party advertising network, which has agreements to place ads on a large number of partner websites. Social Media Advertising - Similar to advertising on websites, ad placement can also be directed to social media outlets such as Facebook, Twitter and Linkedin. While such sites offer the same website advertising options as mentioned above, they go a step further by offering placement options that visually can appear as being similar to user-created information. For instance, the ad may have a visual design that looks the same as a user-created message on Twitter. However, to differentiate these ads from user-created information, social media ads are often contain a "sponsored by" label indicating the message is provided by an advertiser. Email Advertising – Using email to deliver an advertisement affords marketers the advantage of low distribution cost and potentially high reach. In situations where the marketer possesses a highly targeted list, response rates to email advertisements may be quite high. This is especially true if those on the list have agreed to receive email, a process known as “opt-in” marketing. Email advertisement can take the form of a regular email message or be presented within the context of more detailed content, such as an electronic newsletter. Delivery to a user’s email address can be viewed as either plain text or can look more like a website using web coding (i.e., HTML). However, as most people are aware, there is significant downside to email advertising due to highly publicized issues related to abuse (i.e., spam). Start Network AS is a private company that owns and runs the internet service provider Start.no in Norway.